October is National Physical Therapy month and physical therapists are a vital part of the team at John Knox Village East. Most of us don’t relish the thought of working with a physical therapist. We envision them putting us through various exercises and routines as we bounce back from a significant injury or setback. What some of us don’t realize is that physical therapists can be utilized as a preventative measure to help us avoid serious injury. By having access to physical therapists on site, residents at John Knox Village East can receive the treatment needed to either bounce back from injury or avoid the injury altogether and remain as independent as possible. Our ultimate goal is always to return folks to their highest level of independence. Our physical therapists help us achieve this goal by performing various tasks. They treat each patient individually by examining the person, asking them questions, observing their physical movements, addressing their concerns, reviewing medical records and creating an individualized plan for rehabilitation. 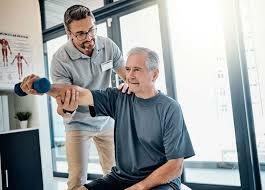 The physical therapists in concert with the person being treated and their doctor create a plan and an expectation of outcomes and then work toward that level of achievement. Physical therapists can also see patients and help a minor injury from progressing into something more sever. For example, one of the gentlemen that live at John Knox Village East had twisted his ankle getting off a tractor. Our nurse saw that he wasn’t walking the way he usually did and asked if she could send the physical therapists to his apartment to see him. He agreed and she gave him some exercises to do and he was back to walking normally in no time and enjoying the independent lifestyle he wanted. As part of the customized plan developed for each person, our physical therapists also come to our resident’s homes and identify modifications needed as they recover from their injury. For example, our physical therapists may suggest the removal of a throw rug that is a tripping hazard, the addition of a grab bar to make it safer to get in and out of the shower or some other enhancement to help someone recover from injury or prevent further impairment. People can also enjoy our spacious, renovated therapy gym and rest assured that they’re being treated by some of the best around. Our quality measure scores are superior, which means you can enjoy a quicker return home. We offer post-hospital stay therapy with shorter recovery times, a whirlpool spa, nutritious meals and social activities. We also follow up with patients once they’re returned home to ensure they’re continuing toward their planned recovery. Call us at 660-584-4416 or email us at info@johnknoxvillageeast.com to find out how we can help you bounce back and achieve your optimal independence.